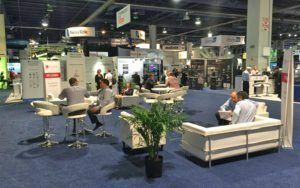 Trade Show Booth and Exhibit Rentals – Just like with anything else, not all trade show booth designs are created equal. Trade show exhibits will range in size from 8′ x 10′ to islands, each of which have a different effect on your booth visitors. Therefore, it is imperative to use different design approaches in order to maximize the impact. Over half of all trade show booths are ten foot booths. Ten feet affords a company enough space to present their message and accommodate attendees. This size is also known as in-line exhibit. These backwall displays are essentially still a two-dimensional medium. In order to take full advantage the limited space is by utilizing attention-getting graphics. Curved wall modular displays work great for this size booth since their surfaces are always facing the attendees by surrounding them with your message graphically. A curved display will focus sound to the center of the booth, which makes it easier to be heard at the busiest of times on the trade show floor. Your trade show display should be more like a billboard rather than a bulletin board. Do your best to avoid the temptation of having a big table at the front of your booth. This creates a barrier between you and your visitors. 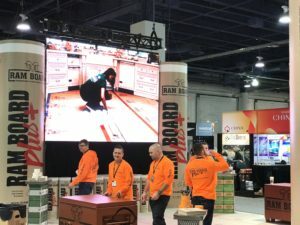 You can always rent a bar height table or a LED pedestal to place literature, a monitor, product samples, and more at the front with your booth staff standing in that precious real estate next to the aisle. Also, having a small cafe height or bar height table with one or two chairs or stools towards the back of the booth enables you to have a place to sit down with your prospects without having that barrier. When you move up to twenty feet of booth space, you delve into a different trade show arena. With twenty feet you have new design possibilities. You can create small work areas within your exhibit for demonstrating product, making presentations, or meeting with clients at around a small table. Twenty feet means you have twice the time to catch an attendee’s eye as they walk past your booth. You can use part of your exhibit for a high impact graphic, and still show smaller detail graphics or display products on the other half. And twenty-foot booth spaces offer greater three-dimensional design possibilities. You can now have a bridge coming off your backwall to the middle of the front of your booth. A bridge puts your name or message at a perpendicular angle to the aisle. Why is that important? Because now prospects can see your name from a greater distance as they walk towards your booth. That gives you even more time to get noticed. Plus, you can also put a tower, perhaps 10′ or 12′ tall, in the middle of your backwall exhibit, for greater attention-getting impact. Backwall booths beyond 20′ let you combine several of the design possibilities of a twenty-foot backwall. However, most exhibitors who grow to a 10′ by 40′ exhibit choose a 20′ by 20′ island exhibit instead. Since backwall displays tend to be a two-dimensional medium, then island displays are true three-dimensional marketing powerhouses. Within an island booth, you have the opportunity to create a work environment for your booth staffers and attendees that accelerates communication and opportunity. You can have separate areas for demonstrating product, writing leads, meeting in private conference rooms, presenting to groups, and even storing staffers effects and promotional giveaways. You can create graphic messages that are seen from every side on towers, bridges, and even hanging signs. And all this can be combined into a single, impressive exhibit that communicates that you’re someone worth doing business with. There is one other major advantage of an island exhibit: More aisle space. A 20-foot by 20-foot island exhibit has 80 feet of aisle space, twice as much a 10-foot by 40-foot space with the same square footage. Double the aisle space means double the chance to stop and engage passing attendees. Even a 20-foot by 20-foot peninsula space, which has aisles on three sides, offers 60 feet of aisle space. With even larger island exhibits, you can create larger environments for conference rooms, theater-seating presentations, product demonstrations, and multiple workstations for booth staffers, with computer monitors and lead processing machines. And according to research, the bigger your exhibit, the higher its memorability. So at trade show, bigger is often better.